PLEASE BE SURE TO WAIT FOR INVOICE BEFORE PAYING FOR ITEM. BEING OFFERED IS THIS SPECTACULAR, X RARE, AND GETTING MUCH HARDER TO FIND, ANTIQUE ROSEVILLE EARLY VELMOSS ARTS & CRAFTS - MISSION LARGE POTTERY FLOWER VASE, IN EXCELLENT AGED CONDITION (PLEASE VIEW MY PHOTOS). IT HAS A FANTASTIC ARTISTIC EARLY VELMOSS ART POTTERY TWISTING LEAFY DESIGN ALONG WITH FANTASTIC OPAQUE TWO TONE GREEN COLORING!! IT IS QUITE HEAVY, SOLID, THICK, CLEAN, STRONG, AND WELL MADE!! IT HAS NO DAMAGE TO MENTION!! IT IS PROPERLY UNSIGNED EARLY ROSEVILLE ART POTTERY!! IT HAS MINOR IMPERFECTIONS ASSOCIATED WITH ANTIQUE ROSEVILLE ART POTTERY AS SHOWN. IT MEASURES A LARGE DISPLAY SIZE: 8 " HIGH, X 5 " WIDE ACROSS THE TOP, X 7 " WIDE ACROSS THE CENTER, X 4 " WIDE ACROSS THE BOTTOM OF THE VASE. IT IS QUITE SPECTACULAR LOOKING IN PERSON AND IS A JOY JUST TO HOLD AND MARVEL AT!! IT HAS NOT BEEN WASHED, CLEANED, OR WAXED. Please check it out, We have many Antiques listed. Thank You for viewing and Have a Wonderful Day! 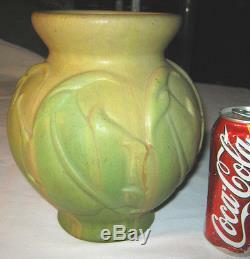 The item "ANTIQUE ROSEVILLE ARTS & CRAFTS EARLY VELMOSS ART POTTERY MISSION FLOWER VASE" is in sale since Wednesday, July 8, 2015. This item is in the category "Pottery & Glass\Pottery & China\Art Pottery\Roseville". The seller is "wheelboy02" and is located in North Grosvenordale, Connecticut. This item can be shipped to United States. Main Color: "SPECTACULAR TWO TONE EARLY VELMOSS GREEN"